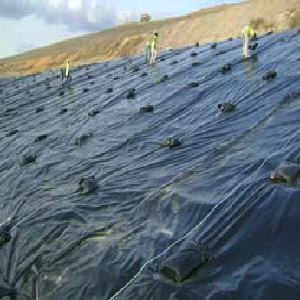 GeoSkrim® R24BV consist of two sheets of highstrength virgin polyethylene film laminated together with a third layer of molten polyethylene. The black outer layers contain carbon black to enhance outdoor life. A durable scrim reinforcement placed between these plies greatly enhances tear resistance and increases service life. GeoSkrim’s heavy-duty diamond reinforcement responds to tears instantly by surrounding and stopping the tear. Click here for Product Data Sheet.